About 20 years ago Patric Blanc left climbers behind and started to create highly designed and engineered green walls. Although intense in maintenance and not very sustainable they are fantastic if built at the right spot. 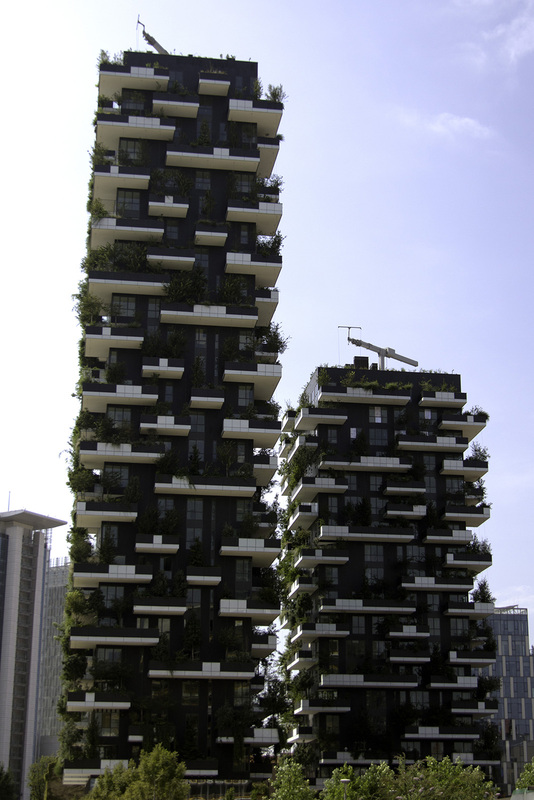 Stefano Boeri took the vertical greening up another step. 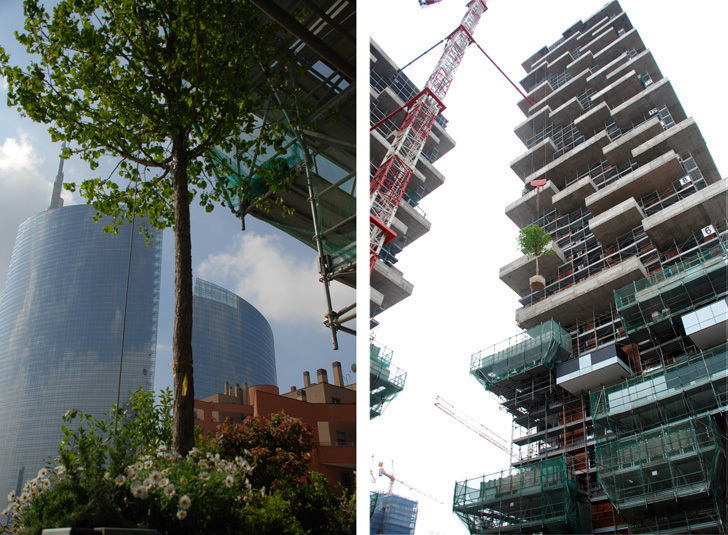 Two residential towers (80 m and 112 m) in the centre of Milan have been planted in 2013 with over 900 trees in different sizes, 5,000 shrubs and 11,000 floral plants. Now the apartments are about ready to move in and the final touches are made on the landscaping to get the development in shape for the EXPO 2015. Standing at the foot of the structures and looking up is a quite impressive view and immediately one wants to go up into a living room and have look out. 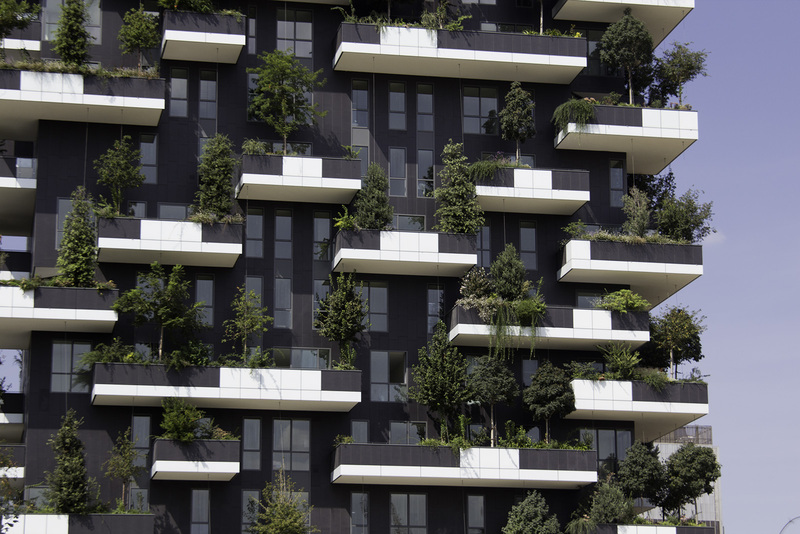 The landscape architects Emanuela Borio and Laura Gatti working with Stefano Boeri, did many trials on plants before they selected them for this planting scheme. Even wind tunnel tests have been done to ensure safety of the exposed plants. The trees were pre-cultivated and managed so they could adjust to their future use. Lifting the trees up and planting them was another tricky task. Its done and it looks good. 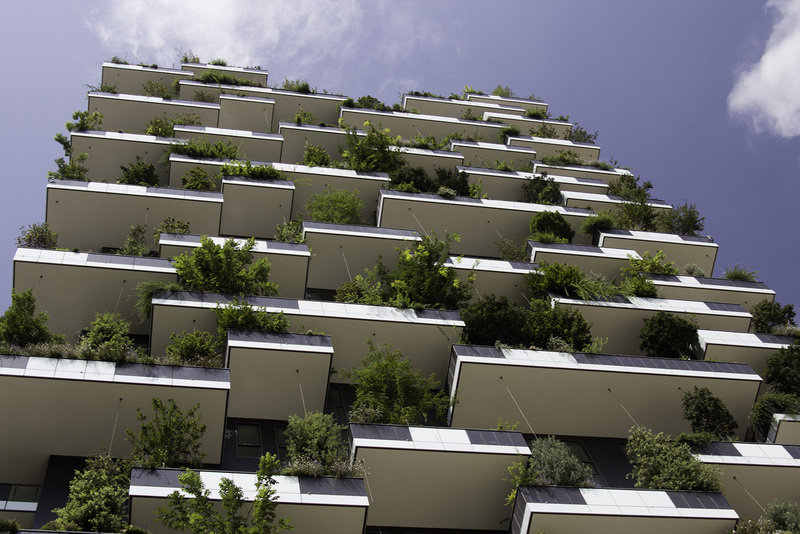 The dark brown background of the facade with some white elements on the balconies provide a strong contrast to the organic forms of the green. The plants are an integral part of the architectural design in this project and offer a great opportunity as they grow and mature, unlike the other components of a design, where the designer expects the materials to stay unchanged or at least to age gracefully. It will be really interesting to see how the towers change their visual appearance during seasons and over the years to come. The careful plant selection, over 1000 different species, creates a unique aesthetic and seasonal experience. The planted towers are the equivalent of 1 ha of forest or would compensate about 10 ha of urban sprawl in the periphery. Going vertical might help to make urban spaces not only visually more appealing, they would also be healthier. The plants filter out dust from the air and absorb CO2, while also providing shade and a cooler micro-climate in hot summer months. The mainly deciduous plants will reverse the effect in winter months and allow sun light right into the living space. It also creates additional habitats for life that is typically reserved for parks and gardens. These could be the missing links in an urban green infrastructure. To me the main advantage is still the overall positive influence of green views to people in an urban environment. The additional costs for the planting and the supporting structures seemed be kept at bay as the apartments are sold starting from 3,000 EUR per square metre. Maintenance is key to the long term success of this project and therefore written into the contracts of the condominium. A specialised company will regularly examine, prune and replace plants if necessary. How sustainability is this type of vertical greening? 6,500 cubic metre of water are estimated to be used per year. With individual calculations depending orientation, floor level and plants used and soil volume available the irrigation is kept to a minimum. The maintenance effort to keep the vertical forest in good shape needs to be seen over the years to come. Even if it is similar to green walls this type of forest could be another fantastic option for providing more green in urban spaces.